Hip-hop musical Hamilton could set a new record when it rocks up at the Olivier Awards on Sunday night. It already goes into the biggest night in the UK theatrical calendar with a record-breaking 13 nominations. Harry Potter and the Cursed Child won nine awards last year, setting a new record for the most Oliviers ever received. The most Olivier Awards received by a musical to date is seven, a record set by Matilda in 2012. 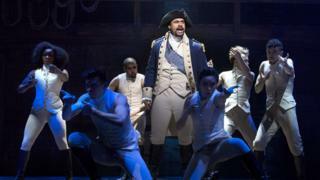 Two of Hamilton’s nominations are in the best actor in a musical category, which sees Giles Terera and Jamael Westman recognised. The musical, written by Lin-Manuel Miranda, fuses rap and hip-hop to tell the story of American founding father Alexander Hamilton, played by Jamael Westman in London. Stephen Sondheim’s Follies, performed at the National Theatre, has 10 nominations. These include two nods in the best actress in a musical category, where Imelda Staunton and Janie Dee go head to head. Four-time Olivier winner Staunton gets another nomination in the best actress category for her role in Who’s Afraid Of Virginia Woolf? Her competition includes Lesley Manville, for Long Day’s Journey into Night, Audra McDonald for Lady Day at Emerson’s Bar & Grill, and Laura Donnelly for The Ferryman. Jez Butterworth’s The Ferryman has a handful of nominations, including one for best new play – in which it competes against Ink, Network and Oslo. Paddy Considine is nominated for best actor for the Royal Court play, which transferred to the Gielgud, alongside Bryan Cranston for Network, Andrew Scott for Hamlet and Andrew Garfield for Angels in America. Catherine Tate is hosting the awards at the Royal Albert Hall in London. Sunday’s event will see David Lan receive a special award for his artistic directorship of the Young Vic. The Time’s Up movement – which is campaigning for an end to sexual harassment – will have a presence on the red carpet, with British stars inviting activists as their guests. They include W1A actress Ophelia Lovibond, who will be joined by Marai Larasi, the executive director of black feminist organisation Imkaan. Doctor Who actress Pearl Mackie is being accompanied by Andrea Simon, campaigner for the End Violence Against Women Coalition. Comedian and actress Meera Syal’s guest is Anjum Mouj, chair of London Black Women’s Project. Performances will include one from past stars of Joseph and the Amazing Technicolour Dreamcoat – including Jason Donovan and Lee Mead – to mark the 50th anniversary of the Andrew Lloyd Webber and Tim Rice musical. The cast of Hamilton will open the show, with other performances from nominated musicals including Everybody’s Talking About Jamie, Girl from the North Country, Young Frankenstein, Follies and 42nd Street. Chita Rivera, who performed in the original Broadway production of West Side Story, will sing Somewhere, accompanied by other stars of musicals – Groundhog Day’s Andy Karl and Dreamgirls’ Adam J. Bernard – along with the Arts Educational Schools London Choir. It is the 60th anniversary of West Side Story debuting in London.